FARMINGTON, ME (October 25, 2018)—Non-traditional, contemporary artist Beth Wittenberg draws from her experiences moving from privilege to marginalization in her UMF Art Gallery installation “Consumed.” The University of Maine at Farmington exhibit is on display from Oct. 25–Nov. 30, with an opening reception 5-7 p.m., Thursday, Oct. 25. The event is free and open to the public. Over the past 15 years, Wittenberg persevered through a major health crisis, an experience shared by many other Americans fighting for visibility and access to health care during illness. In 2016, using trashed, consumed, or simply discarded materials, Wittenberg began a series of sculptures, “Throwaway People,” addressing people denied access to “the system”: indigenous peoples and their fight for clean water, the trans population fighting to claim their identities, gay adolescents undergoing conversion therapy, immigrants, homeless people and ethnic minorities. 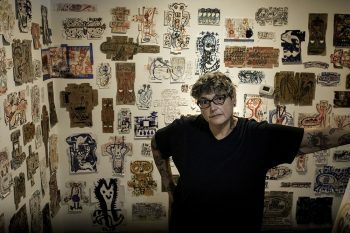 Wittenberg began the drawings that form the center of Consumed when she could no longer afford her medication and she repurposed her pillboxes as surfaces for her private, sometimes violent, sometimes poetic iconography. Drawing on philosophy, art brut and outsider art, Wittenberg’s work belongs on the street. But containing it within gallery walls gives it a different kind of intensity and a new, contemplative audience. Her process is intuitive, and she sees the words and images in Consumed acting in a vigorous, liminal, transitional space that mirrors the complexity of today’s accelerated and disorienting social transformation. Beth Wittenberg received her MFA from Maryland Institute of Art (MICA) in 1998 and her BA in philosophy and BFA from Slippery Rock University in 1989 and 1991. In 2017 Wittenberg was a guest artist for the Water Bear Confabulum, a street-arts event in Farmington Maine. The UMF Art Gallery hours are noon-4 p.m.,Tuesday through Sunday and by appointment. For more information or to make an appointment, contact Sarah Maline at maline@maine.edu or 778-1062 or visit artgalleryumf.org. The UMF Art Gallery is a teaching gallery dedicated to bringing contemporary art and artists to campus and the regional community. In its focus on innovative and challenging new work, the gallery reinforces the academic vision of the university and the Department of the Visual and Performing Arts in celebrating art as a powerful agent of community and cultural identity. The gallery develops interdisciplinary educational opportunities for students and community and works with local schools to integrate art into their curricula.